One of my favorite genres and one that is the easiest for me to push aside is middle grade fiction. This year to make sure I get a little more children's and young adult fiction I thought I would designate the first Monday of every month Middle Grade Monday. While a lot of my picks this year are classics I am trying to branch out a little bit and read new or at least recent releases. This month's book is Wednesdays in the Tower by Jessica Day George which is the sequel to one of my very favorite reads from last year - Tuesdays at the Castle. Blurb: A castle that is constantly rearranging itself, and a young royal family sworn to protect it... Celie, Rolf, and their beloved Castle Glower are back in this exciting sequel. As a parent I really had no issue with this one. While there is some deception it's not particularly terrible and it is necessary. As well Celie really wants to be truthful. It doesn't lapse into preachiness which could put off younger readers - it's simply a great adventure story with some magic. I think it would be wonderful for readers who are 8 and up. I love this series! I've read the first three and enjoyed them so much. I'm glad you enjoyed this one, even though it didn't quite grab you like the first one. Oh, thanks for this recommendation! I have a couple of young grandkids that might very well enjoy this. 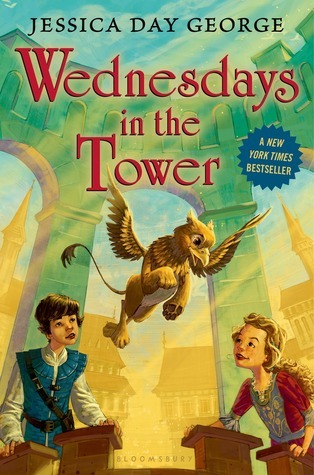 I'd heard of the first, Tuesdays at the Castle, and I did read one book by this author a few years ago. This isn't a genre that I read, but I do love to hear opinions on all kinds of books. I love MG fiction and am so glad to see it featured here! I feel like it doesn't get enough attention in the book/book blogging world. Who are your favorite MG authors? I love almost everything by Katherine Applegate, Cynthia Lord, Margaret Peterson Haddix, Kirby Larson, etc. This sounds like fun even with the slower start. I really need to read more middle grade books. I agree with this review. Didn't like it quite as much as the first one, but just a minor quibble. and these are so clean and wholesome, perfect for kids. I guess there ended up being 4 or 5 of them, but I've only read the first three I think? I agree with you on pretty much every count. Like you, I didn't find this one quite as magical and perfect as the first book, but I still really enjoyed it. I would have loved reading these as a child, or later on, reading them to my child, but alas, they came along too late for either. Still fun, though!